Hook the knee over the arm placing the inside of the thigh over the triceps. Extend the other leg diagonally out. Have both feet down until you position yourself. Shift weight forward so that the upper bodies weight and force causes a lift. Hard postures should be approached progressively. This will benefit students in a number of different ways, strengthening their confidence and self belief. 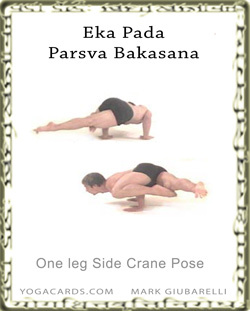 Choose postures that are very similar in form but a little easier. An example of this would be allowing the ball points of the foot to touch the mat of the floor. This will greatly reduce the arm strength needed.